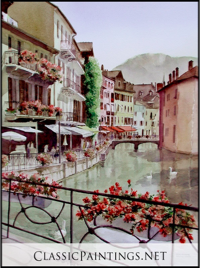 W/C The delightful, alpine, canal village of Annecy, France. Just about 40 miles south of Geneva, in the French alps, this romantic village just waited to be painted. Every where I turned was an intriguing scene. The French flower boxes are everywhere and add a lovely touch of color. Of course my family and I thoroughly enjoyed dining in the cafes alone the canals. 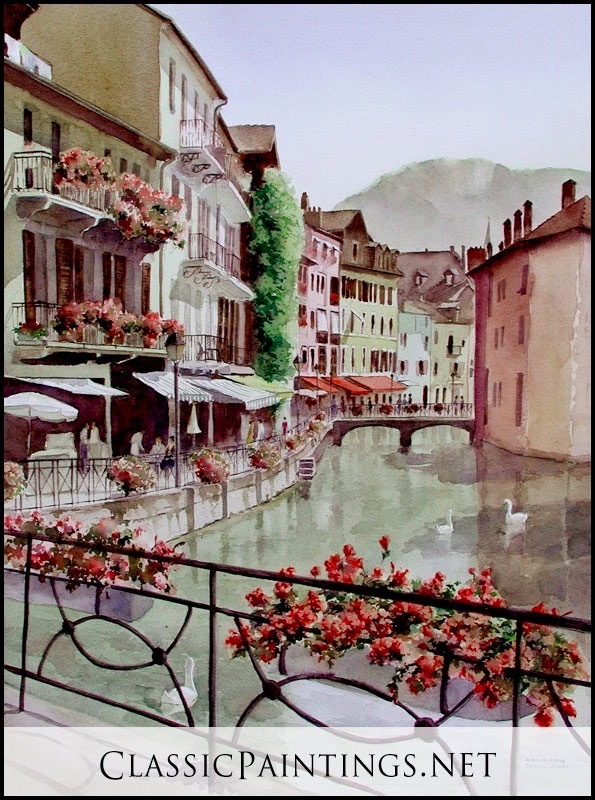 W/C The delightful, alpine, canal village of Annecy, France. 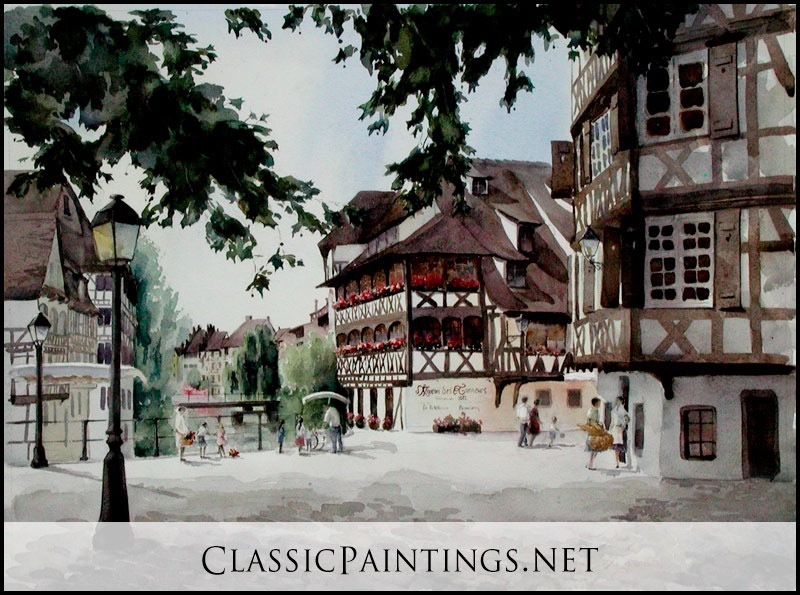 Just about 40 miles south of Geneva, in the French alps, this romantic village just waited to be painted. Every where I turned was an intriguing scene. The young children standing at the well with their reflections in the water, just had to be painted. The flower boxes are everywhere and add a lovely touch of color. Of course my family and I thoroughly enjoyed dining in the cafes alone the canals. 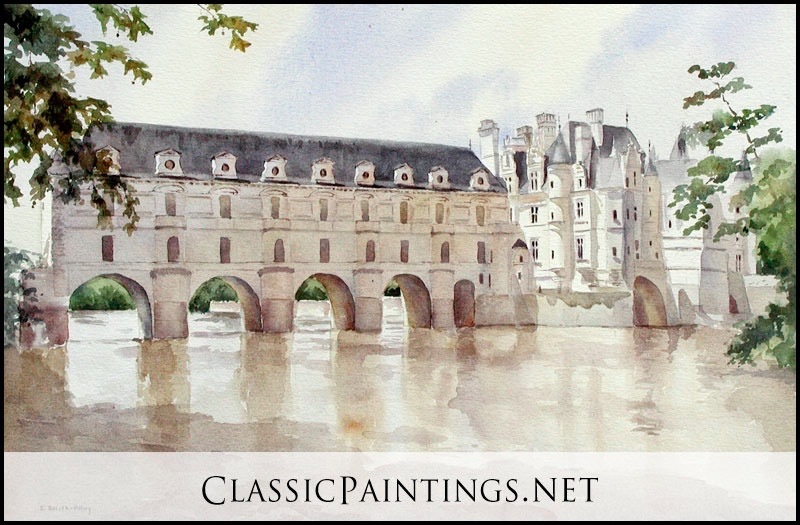 W/C Chateau de Chenonceau is in the Loire Valley of France. Henri II built it for his mistress Diane de Poitiers. At his death, his wife, Catherine de Medicis took it over. It is a magnificent chateau with beautifully preserved grounds. I painted this on a camping trip with my family through the Loire Valley. W/C La Petite France is a delightful, medieval quarter of Strassbourg, France. The half-timbered houses, giant sycamore trees, cobblestone streets and the locks make it truly a fascinating place. La Maison d’Tanneurs is a famous restaurant in what was the original tanning house. 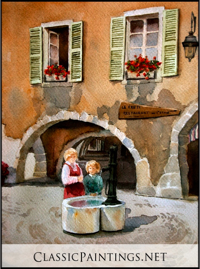 The young girl and boy are my children and this was painted during a visit by my in-laws while we were living in Germany. 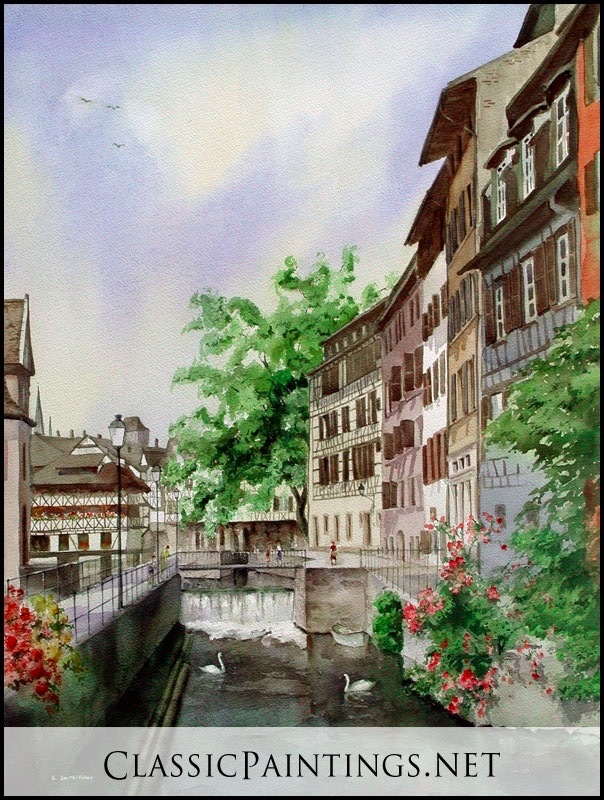 Strassbourg is one of my favorite cities in Alsace. 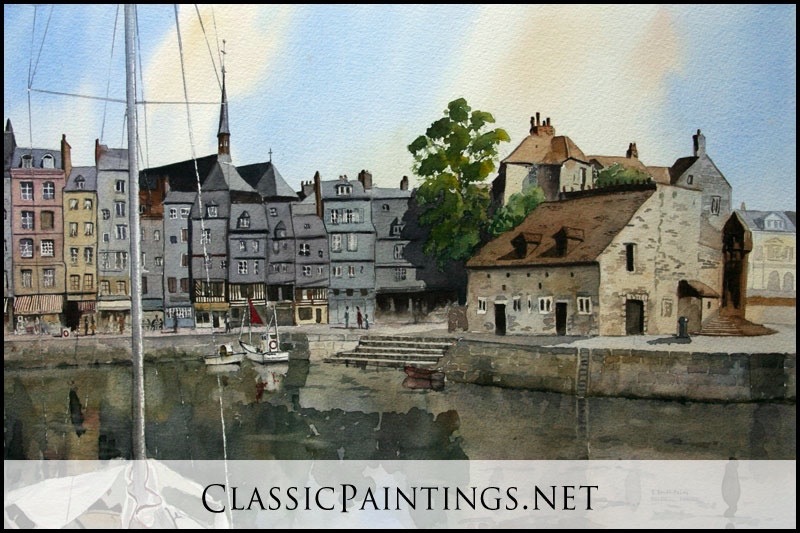 W/C Honfleur, France is a delightful medieval village. It is an artist’s paradise. There is a lock system that keeps the old harbor full. Boats enter only during high tide twice a day. Outside the inner harbor boats will be laying on their keels when the tide is out. Fresh mussels and “Fruit de Mer” are specialties. 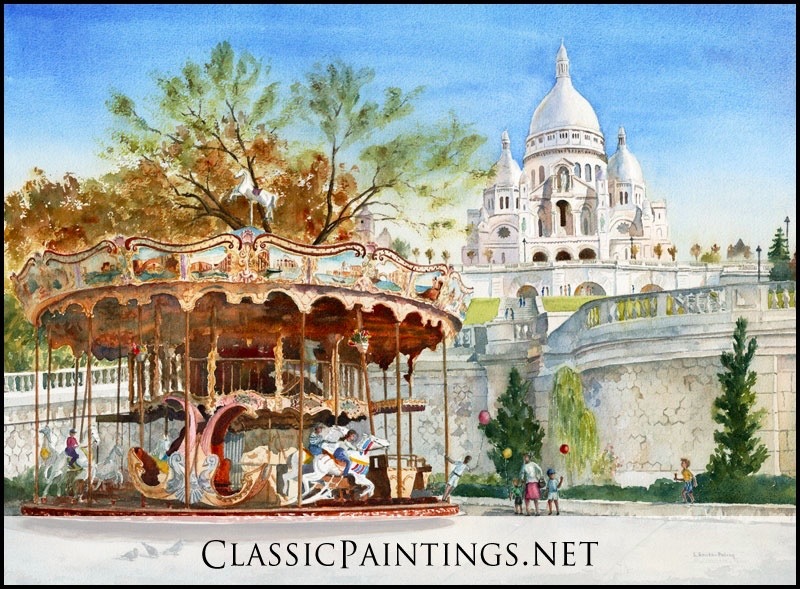 When I wasn’t painting, my husband and I enjoyed the outdoor cafes. W/C The boat locks at the La Petite France quarter of Strassbourg, France are fascinating. We camped and my father and I sketched and painted. 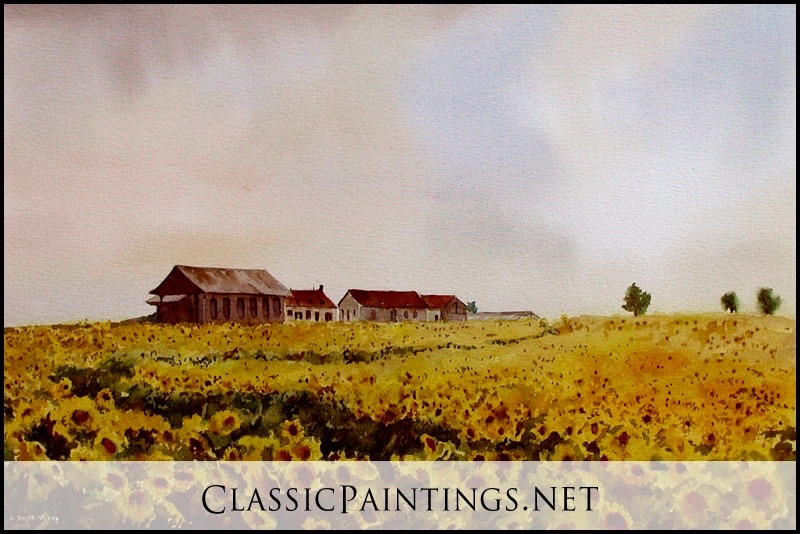 W/C Loire, Valley, France- In late summer, the sunflower fields provide a beautiful contrast in color. This particular day grew cloudy and gray, but the bright yellow flowers were set off against the gray and appealed to me. My children were playing at the base of the flowers and were only half as tall as the stalks and were quite hidden.